Combine the vinegar, agave, lemon juice and cinnamon sticks in a small saucepan over medium-high heat. Once the mixture comes to a boil, cook for 10 to 15 minutes, stirring occasionally, until it has reduced to a syrupy 6 to 7 tablespoons. Remove from the heat; let cool completely, then discard the cinnamon sticks. Whisk in the oil, along with the salt and a good pinch of pepper. Just before serving, cut the apples horizontally into very thin slices, discarding any seeds. 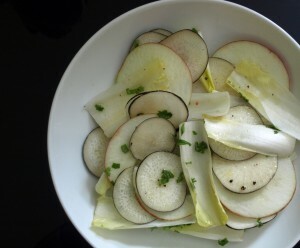 Place them in a large serving bowl along with the endive, radish and parsley. Pour the dressing over and toss gently to coat. The dressing can be made several hours in advance and held at room temperature. Re-whisk just before serving.